For MCS and allergic particulate disorders. The Respro® Allergy™ Mask has been developed with the hyper sensitive individual in mind. Chemical and particle sensitivity for some people can be completely debilitating. Even the smaller concentration of a chemical can have a marked effect on an individuals well being. 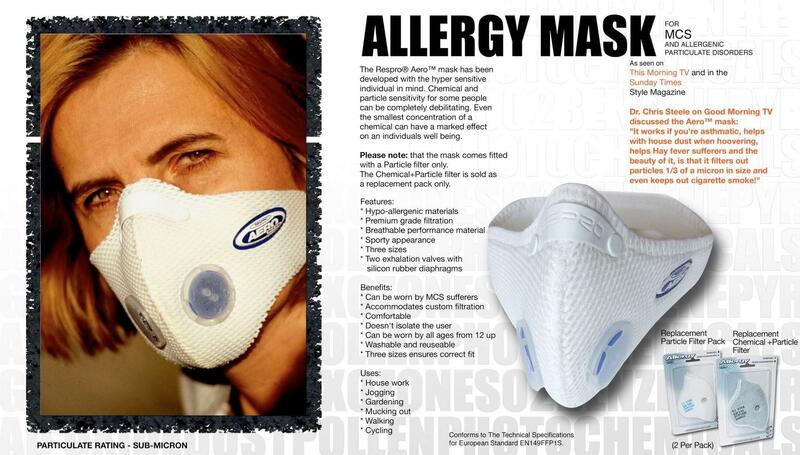 For more information or to buy a Respro® Allergy™ Mask, visit our website www.respro.com. I have to travel a lot for work and recently I went to Bangkok. When there I got nose bleeds throughout the day, headaches and found it difficult to breathe. I was told that I was suffering from pollution sickness. Normally I live in an area that is not very polluted, however I am allergic to dust but it’s totally manageable. With my new job I will be traveling more and more to big cities and Asia in particular and I need to be able to get outside without bleeding or struggling to breathe. Which mask would you recommend for me to take with me when I travel? Thank you so much for your response in advance. Any of the following masks which come with a combination filter would be suitable for exhaust pollution (VOC’s and PM 2.5’s) airborne viral and bacterial matter, and cigarette smoke. A combination filter has both a Hepa-type filter layer and a DACC layer. This combination of Hepa-type filter layer and DACC in one single filter provides sub micron (smaller than PM2.5) dust filtering capability, together with DACC capability for filtering gases (VOC’s /Acid gases) and vapours . It is the best type of filter available in our range for dealing with the broad spectrum of vehicle and non vehicular pollutants commonly found in major cities across the globe. For your circumstances and environment, I would go for the Ultralight Combo kit as this would be considered the best all round product for summer winter urban and non-urban environments. The most economical solution would be the Techno mask as this has a combination filter similar in specification to the Respro® Cinqro™ Urban filter. A point worth knowing: all of our masks have interchangeable filters and valves to allow you to choose the best option of mask and filter dependent on your needs provided the size of the filter and the size of the mask is the same. ie; large filter/large mask. The usable lifespan of the ‘Combination’ filter is based on the characteristics of the active urban cyclist. If you are using the mask for another activity it still applies, but your breathing rate and activity would put the lifespan of the filter at a proportionally shorter or longer time. 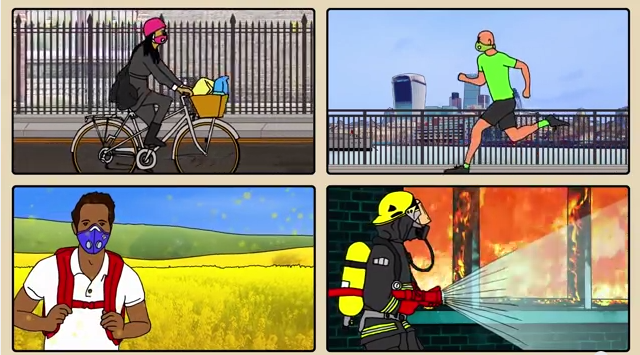 If your breathing rate is say half that of a cyclist then the effectiveness of the filter would be twice as long. For cycle commuting on a daily basis we recommend that the filter should be replaced every month or every 69 hours, whichever is sooner. hello. I want to purchase a respro mask. what kind do you recomend? i need one that really filters fragances like perfume, cologne, and other beauty products, also cleabing products like detergent, fabric softener, air freshebers, etc. But i want somethig that is little and light weight because i want to use it at work and i dont want people to stare too much. We differentiate mask use into two camps. The first camp being users who do not have a respiratory problem but want to minimize exposure to pollution and those who have a respiratory disorder and are looking for a solution that will assist them in minimizing the resultant physiological effects of exposure, in your case to various chemicals and particulates both inside and outside in the environment. You fall into the second camp and we would recommend the Respro® Allergy mask with a chemical/particle ‘combination’ filter (available as a combo here) The mask comes complete and ready to use. the Allergy mask is not made from neoprene and is air permeable for easy of use and comfort. I have attached a review sheet for your consideration as to the validity of this product. Hi major problem with pollution in Durban South Basin south africa where can I buy this mask in south africa. My husband band died just recently with lung issues, my neighbour of lung cancer the same week, the neighbour next to him also lung issues the year before. Asthma and lung cancer prevalent in the area. Surrounded by chemical and paint factories and it scares me that thi has gotten out hand so I need a mask urgently. We also have an oil refinery in the area . Unfortunately we do not have a supplier of our product range in SA, much to our disappointment as we do sell Respro® into 26 countries. We recommend the Techno™ Mask where pollution is high and full of diesel particulates. The Techno filter in the Techno mask is the Sports filter and the City filter combined giving the user both sub-micron particle filtration with gas and vapour filtration. The filter has sub-micron filtration capability which means is that it is able to trap particles less than one micron in size which is more than capable of the removal of pollen and the heavily publicized 2.5 micron particulate material (PM). The DACC Activated charcoal layer within the filter has excellent adsorption properties when it comes to chemical gas and vapour uptakes. With its particulate filtration capability and its capability of filtering VOC’s it is the best filter available in our range for dealing with the broad spectrum of pollutants commonly found in major cities across the globe. 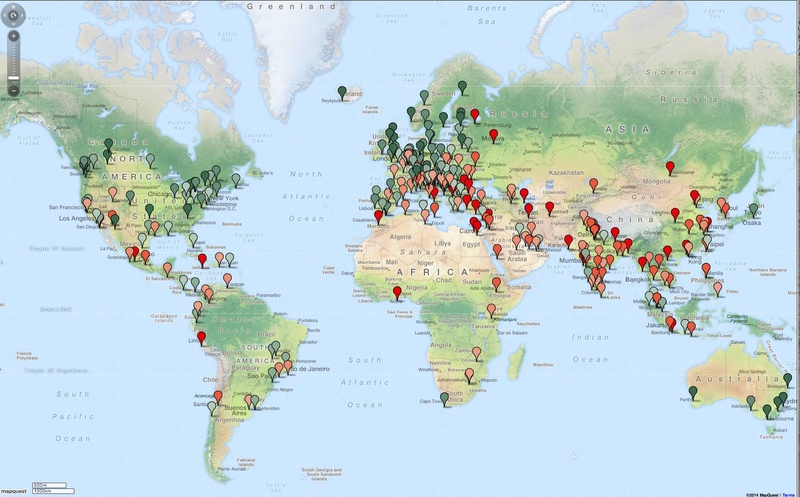 We provide a free shipping service anywhere on the planet. To SA it takes about 10- 21 days. We do offer FEDEX/UPS courier services which are much quicker, these are available at the Checkout and are charged at cost. If we have advised you of the size for your mask and it is subsequently found to be and incorrect size, then we will exchange the mask. If you choose to make the decision on the size of the mask and purchase the wrong size, then we are not at liberty to exchange the mask as it is considered a personal item. Under the Consumer Contracts Regulations June 2014 if the item has been used or the seal broken then we are not liable to refund or exchange the item as this poses a contamination and subsequent product liability issue and therefore we are unable to resell the item. Using piece of cotton or string, measure the circumference around the neck. use a ruler to determine the length of string. This is the neck circumference. Easier still check your shirt size. Using piece of cotton or string, measure the circumference around the head. use a ruler to determine the length of string. This is the head or hat size circumference. First of all, thank you for making these masks. I have severe debilitating allergies and hyper sensitivities and am dependent on your Respro Allergy Mask on a daily basis. The impact your allergy masks have on the quality of my daily life is immense. Thank you. With that said, it does get a bit boring having to wear the same blue or white mask several hours a day, year in, year out, and the Respro skins on your website looks really cool. Can the Respro allergy filters and valves be successfully paired with the Respro skin outer-shells while still maintaining its function as a secure allergy mask? And if not, is it possible with any of your other, more colorful masks, like the Sportsta or City masks? use the Respro® Allergy mask as a basis for fair filtration. If you are looking for a different colour mask shell, the Ultralight Mask is made from the same material as the Allergy Mask. appreciate it if you write a review about your experience with our customer services. What kind of mask would u recommend for best filtration of allergens ? Also..how often do we replace filtration? The Allergy mask as standard is the way to go. The mask shell is made from air permeable material which is good for facial ventilation and comfort. It also has exhalation valves for humidity control in the mask and an excellent Hepa-Type sub micron dust filter (good for your pollen issue). The Allergy mask on its own, comes complete with Hepa-Type filter and is ready to use out of the box. On an aside, as pollen can enter the system via any mucous membrane which includes the eyes, it would be sensible to also include eyeware in any protection plan. I just asked about the allergy mask vs perfume. I have another question…my son would prefer a black mask but I see that the allergy mask only comes in blue and white. Would a black Sportsa mask work if we got the allergy mask’s filter? My son has vocal cord dysfunction, a non-treatable breathing condition, that is triggered by certain molecules in the air. The worst offender for him is perfume &/or cologne. I am not sure where to look up the particle size of perfume so was wondering if your allergy mask would be able to keep perfume particles out? We would recommend the Allergy mask with combination filter. This filter provides both Sub-micron particle filtration and gas/vapor filtration including molecules of VOC’s like perfumes. An alternative is the Ultralight mask with Chemical particle filter. The essential difference is the valves which are better for sports activities if undertaken by your son. All our masks are manufactured to the technical specification of EN149 FFP1 which is the equivalent of N95 in the US. I work with medical marijuana and am very allergic to it. We wear basic surgical masks that do not help keep the particles out. would this mask help with that ? We consider any dust/smoke an airborne particulate. Typically they are carried by other particles of dust dirt etc., including water droplets. So if you were to use the Hepa-type filter within the Allergy, Sportsta Ultralight or FB-1 mask then you should have adequate protection. The protection afforded by the Hepa-type filter includes cigarette smoke particles which are sub-micron in size – the filter material is tested to 0.3 micron sized particle and is rated at 99.7%. As the size gets smaller so the efficiency drops. However most particulates present are in the 0.5 – 50 microns in size. I hope this is of assistance and please get back to me if you need more info. I h ave severe chemical allergies and it sounds like this mask would help. But not all suppliers in the US to ship to Canada. or do know of a supplier in the US that will ship to Canada? I have listed some dealers/suppliers below for you. The Respro® Allergy mask has a sub-micron particle filter for the removal of pollen, animal dander and most innocuous particulates that some people have an allergic reaction to. It has breathable material comes in 4 sizes and is made from materials that are not considered to be allergenic. The important thing here is that it fits correctly. So sizing is particularly important. An X-Large Allergy mask will fit a larger than regular sized male or an extra large female. wich is the price? and can send it to all usa? Hi, The Respro® Allergy mask is available in the US from the following suppliers and varies in price. STOCK: Sportsta, Techno, Cinqro, Respro® Allergy and Bandit. I live in an apartment flat and I have neighbours of eastern origin. Personally I am very sensitive to all kinds of spices like black pepper, wasabi and many others. Unfortunately my neighbours like to use a lot of spices in their dishes and around meal time the pepper particles from their meals enter my home, causing me great discomfort. 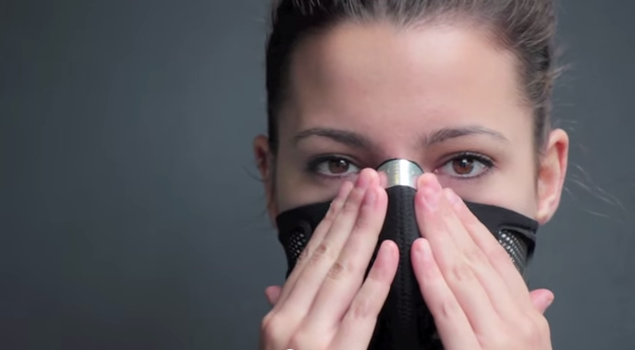 Do you think this allergy mask could provide relief? I understand if you can’t guarantee any of the masks will work but hearing my story, which of your respro masks would you recommend to “filter the pepper particles” if I wanted to give it a try and see if it helps?